With the stock tank system I am doing 50-100 gallon water changes every two weeks. The concept with this system is that I have a very low bioload to maintain and allow the system to maintain itself for the most part thereby reducing the systems energy needs and making it more survivable in the event of a power failure. I discovered with my previous system that the corals and inverts I keep do the majority of the cleanup themselves and actually adaped to the availability of detritus by increasing the population density of their coral polyps. This takes care of the uneaten food and detritus, and POM. The DOM was removed with water changes and/or skimming. I had very prolific coral growth in the previous system. In the first stock tank I have employed a 12" sand bed beneath the egg crate platform. This remains undisturbed except for the copepods and mini brittle stars that live in that system. It does not get vacuumed. This is an experiment but does not seem to be causing any problems to date. The second tank only has a few soft corals at the moment and I have not really considered syphoning the bottom. If buildup becomes an issue, I will make a hole or two in the egg crate that will allow me access. For now it is not a problem. In the third stock tank I have two large liverock sculptures. This is not a permanent configuration. I plan to add a fourth tank to the system and with that will add a Euroreef CS 12-2 skimmer and probably a hundred Lbs or so of LR for additional bio-filtration. The skimmer is rated for 400 gallons, but with the low bioload I have I should be able to effectively skim eight or ten tanks with just the one skimmer. 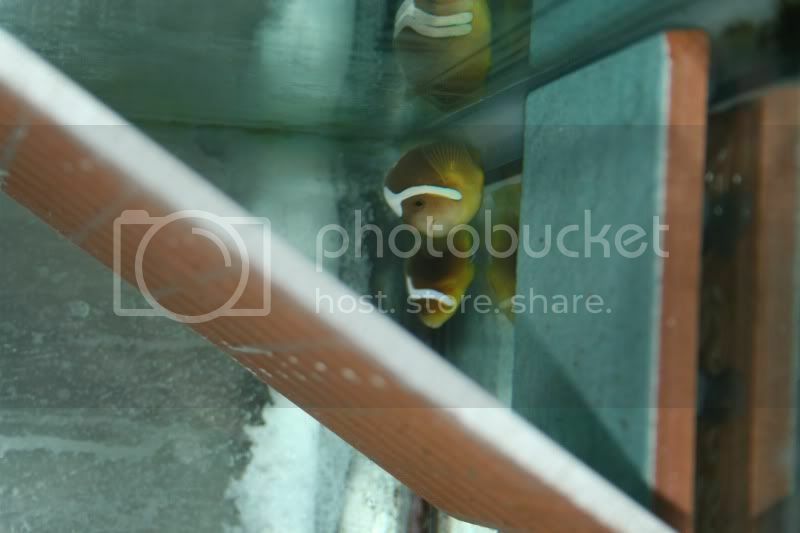 Fish do have access to the underside of the egg crate platforms but the clowns typically stay on the upper side. The tangs usually go back and forth unless I am spotted, at which point they retreat underneath the platform. Hey Howard. Doug from WAMAS. Tagging along. Just started my hand at breeding as well (ocellaris for the fun of it) . One clutch through meta, second hatching hopefully tonight. Anyone else in CMAS breeding? Any of your pairs spawning? How's it goin'? This is Walt. Howard is HVF21221 (or something close to that.) The only other breeder I know of from CMAS (Chesapeake Marine Aquaria Society) is bschulz and he really doesn't post much anymore. Howard would have a spawning pair of leucs by now. He's got a lot more experience at this modality. None of my clown pairs are spawning yet but I think one or two might be close. Most of the older pairs are difficult pairs to begin with, were paired up in my systems one to two years ago and have not had a stable environment to speak of since. I've moved them around from system to system trying to decide what would be the best configuration. The easier spawners are the newest additions. So, I will not be surprised if it takes another six months to a year to get a spawning pair out of the lot. Of course I may throw in the towel and buy a spawning pair just to speed up my OJT. To date the only thing spawning are the rollandi damsels and I'm not really that interested in trying to raise them. Oops! Oh well-- I remember his problems with brook a while back. Lost some gasters as I remember? Just glad to have some local references if I decide to try more difficult breeding stock. I think I will stick to erectus, bangaiis, and ocellaris for now. Because damsels are reportedly very difficult to raise. It's bad enough I'm starting out trying to raise leucokranos, chrysogaster, latezonatus and thiellei. I don't know what level Howard is sustaining in the hobby. He was scaling back the last I heard from him and could be out all together for all I know but he would be a good person to bounce some ideas off. So would Bob Schulz. There are a couple in WAMAS too. Marina P. comes to mind off the bat. dbartco wrote: Oops! Oh well-- I remember his problems with brook a while back. Lost some gasters as I remember? MarinaP moved to Russia... I have been talking with Traveller7 (Scott) a bit. Best of luck and keep us yocals in mind when getting rid of your "leftovers". I don't have S strain rots (scott was talking about getting), but if you ever need the L to get going... I'm up that was fairly regulary. WT#!!! I don't recall anyone asking me if that was OK.
Well anyhow, Scott is the other I was thinking of. I just had a brain fart and couldn't remember the screen name. If anyone you know in that area is interested in some gasters, I have four available now. $225.00 a piece for paid members of any forum I belong to. Just site this thread in case I forget. Well the latest is I've sold my five 'gasters (lost interest) and one of my leucs. My thiellei/ocellaris female pairing did not work out as hoped. The thiellei is where the latz used to be. She somehow managed to get through the pond netting and turned herself into fish jerkey. I still can't figure out how that happened unless she did it the night before while I was doing maintenance and I just somehow missed it. 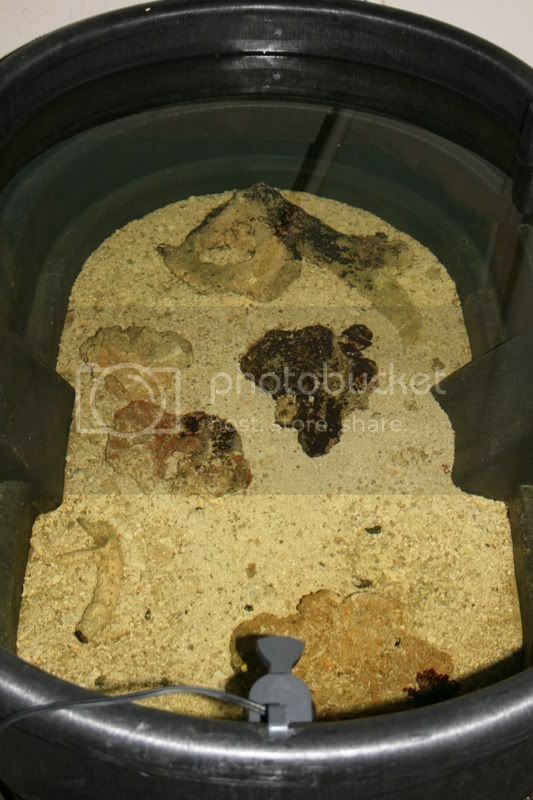 I added my Euroreef CS 12-2 skimmer to the rubbermaid tub system where the leucs and thiellei were residing. I'm in the process of filling that sump with liverock for added biofiltration. I got good skimmate the first week, but after that it dropped to almost zero. I guess the biofiltration was working pretty well on it's own. The two leuc pairs are now in 10 gallons. I may move them back into the rubbermaid tubs in place of the nigripes pair. I think the leus will be happier in an anemone/coral farm. Moving the nigripes concerns me though. They're just so stinking delicate. So Walt, still nothing breeding right now? ...and it kinda sux. I haven't lost hope but I am a little discouraged. I haven't exactly stacked the ods in my favor either. I have not bought any proven pairs, I have moved most of my fish around every few months, and apparently I need to feed meatier foods (which I kinda knew.) Let me not forget that most of my chosen pairs fall within the two hardest complexes. Skunk and saddleback. I'm just not interested in the easier types. On the positive side the two thin bar frenatus I have that were the same size when I got them are now very different in size now. The female is about four times the size of the male. My leuc pair female has grown a little too. I haven't caught any cleaning behavior to date, but then again I only really look at the tanks twice a day just long enough to feed them and do a head count. I sold off most of the remaining corals keeping only a few zoo, paly and xenia frags and have been concentrating on clowns and anemones. I couldn't get current pics of everyone but I did get several. My latz are spending most of their time in separate anemones, but when they realized that the big scary flashy thing was attacking them they decided to cooperate on the photo op. My nigripes were moved from the stock tank to a 10 gallon because they were living separate lives. I was concerned that they would both be female and kill each other. Luckily my concern was unfounded. My percs have been getting along well. I think the male is still quite immature to expect any spawning any time soon. My Os are in the same boat. The male is just too small. I do have an odd pairing. This was wholly by mistake. These were the wretched refuse (sump fish.) They seem to be getting along well. I think they would make an interesting hybrid.... would probably look like leucs. The thiellei and the previous three attemps at a mate were really pretty cold. This new pairing has a bit more potential. There was some intense aggression in the beginning. Now there's a lot of posturing and twitching. These are my latest additions. Until someone tells me different, I'm calling this A. barberi. That last pair, could the be rubrocinctus? Clownfish75 wrote: That last pair, could the be rubrocinctus? They are similar species. Why do you think that? I added a Carlson surge device to the main anemone tanks last night to replace my powerhead. No more chum grinders in the tank!!! This will hopefully benefit the pod population too. Well, i got a second thiellei. They get along swimmingly. I got four 45g cube tanks. ...and started drilling and decorating them. I started selling off my common livestock to make room for my new tanks and I donated one of my leucokranos pairs to Atlantis Marine World with the understanding that if they got them to breed that I would get one of the clutches. ...and got a great trade for one of my baby black O pairs.... I got a spawning pair of WC black Os. Nice pics! I'm just joining in on this thread now, but, how did you 'decorate' the tanks? It looks awesome! Drilled the hole using a dreml and a diamond tip and installed the bulkhead. I cut and installed the eggcrate faux wall the way I wanted it using GE 100% silicone. I covered the exposed silicone with aragonite sand to give it texture. I filled the majority of the holes in the eggcrate using "aragocrete." Leaving several random holes open for flow and allowed it to cure a little. I placed a few pieces of baserock and branchrock on the eggcrate and used more "aragocrete" to give the panel texture. I decided that I didn't want to see anything that looked manmade when viewed from the front; so I repeated the process with the sides. My H. magnifica has been looking rather shoddy for the last few weeks. So, I decided to try a situation where it could get more flow and light. I figured 25 WPG would suffice. I'm not sure yet whether it likes it or not. It did spit out some zoanthellae yesterday. I figured maybe it was too much. I put a second piece of eggcrate in and it seemed to significantly reduce the intensity. I also decided to see how the A. thielleis would react to it. They seem to like it. I've significantly reduced my livestock and plan to install the four 45gallon cube tanks in the wall that I've been drilling and decorating. I also plan to buy two more tanks for a total of six built into the wall. For now I just need to rebuild the wall. I've accepted the possibility that I may never get a spawn out of any of these pairs (although the black Os are a proven pair.) I have these species because I like them. Not because their spawn woud be extremely valuable. Actually the two pairs I'm least fond of are the most likely to spawn for me and are least valuable. I forgot... A. nigripes. Easy to forget. They always hide. After a year of residing with me in relative good health, I noticed that my male latz was reluctant to come out for food two nights ago. Last night he didn't come out at all, so naturally I was a little freaked out. When I found him it was clear that he had been brutally attacked by the female. He also was swimming in circles looking disoriented. He had spots of what looked like slime covering his body. I thought BROOK!!! AHHHH!!! When I got ahold of myself I figured it might be from the thrashing he had. So, I moved them into a quarrantine tank. Yes, I moved the female too because, while she is the root cause of this I know that once moved she would calm down. I figured it would be best tno to split them up. Also, if there were some paracite that decided to attack, that she might also be affected. I dropped the salinity to 1.015. I couldn't go any lower because my FW is not heated. As it was, I dropped the temp from 76F to 71F. I will drop it down to 1.009 tonight. In any event, he looks better with regard to the slime and disorientation and the wifey is treating him well again. As you can see here, he did get thoroughly thrashed. I also took the opportunity to empty out the DSB that was in their tank to start taking care of a plague of aptasia. I had about 25 gallons of sand forming a layer that was about 6" thick in the bottom of the rubbermaid tub. I am pleased (and a little surprised) to report that there was absolutely no foul smell to the sand. I had been a sand basher before I decided to give it one last go and did some heavy reading on the subject. I now feel comfortable using this media again... and without the persistant desire to vaccuum it.